Justice Hussein Baba-Yusuf of an FCT High Court Maitama, on Tuesday, issued a production warrant to the Director General, Department of State Service (DSS) to produce Col. Sambo Dasuki (rtd) in court to face his trial on May 24. Dasuki, a former National Security Adviser (NSA) to former President Goodluck Jonathan, was arraigned by the Economic and Financial Crimes Commission (EFCC) since 2015. On trial with him are Aminu Baba-Kusa, a former NNPC Executive Director, and two firms – Acacia Holdings and Reliance Referral Hospital. Production warrant is issued when a defendant is in the custody of the state as is in Dasuki‘s case. Earlier, the prosecuting counsel, Mr Oluwaleke Atolegbe, had expressed surprises when he found out that Dasuki was not in court. Atolegbe told the court that it was the duty of the DSS to produce the dependant who was in their custody. Dasuki‘s counsel, Mr Victor Okwudiri, told the court that it was the duty of the prosecution to produce the defendant in court and it is their duty also to explain his absence. Counsel for the second defendant , Mr Solomon Umoh (SAN), told the court that it was now a common knowledge that the defendant was in the custody of the state. Counsel for the third and fourth, Mr A Rilman and A. Ayodele, aligned with the learned silk. The Department of State Services (DSS) says it has returned Sani Baba-Inna, Aisha Buhari’s aide-de-camp (ADC), to the police. Peter Afunanya, public relations officer of the service, disclosed this in a statement on Wednesday in Abuja. The police had on September 22 handed Baba-Inna to DSS for investigation over the alleged use of the first lady’s office to defraud people of N2.5 billion. He was alleged to have carried out the act in the name of the first lady. Afunanya said: “Investigation, however, revealed that he was never, at any given time or circumstance, directly or indirectly, instructed, by the first lady, to act or collect, in her name, money or material gifts from any person(s) or group(s). The family members of the immediate past Chief of Defence Staff, Air Chief Marshal Alex Badeh (retd. ), may miss his burial as they remain on the watch list of the Department of State Services and the Nigeria Immigration Service. Badeh’s widow, Mary Iya Badeh, and his two sons, Alex (jnr) and Kam have been in the United States since 2016 following his prosecution by the Economic and Financial Crimes Commission, EFCC. A family friend of the Badehs said that it was unlikely if they would come. “I have spoken with them and I don’t know for now if they will be coming but it is highly unlikely. Their father has just been killed under controversial circumstances and the government has not removed them from the watch list. If they return and their passports are seized and they are not allowed to return, it would be a double tragedy. A prosecution witness, Abubakar Madaki, had told a Federal High Court sitting in Maitama that Badeh’s wife and two of his children were being investigated for offences with which the ex-Chief of Air Staff was charged. Madaki said the three of them, however, escaped to the United States before the investigation was concluded. He said all attempts to get them arrested turned out to be futile. The witness had said, “At the initial stage, when we started the investigation, we invited Alex Badeh (Jnr.) who lives in 19 Kumasi Crescent, Abuja, one of the properties, among the properties earlier mentioned. “He happened to be a son of the first defendant (Badeh). He claimed to be a tenant in that property and since an investigation was ongoing at the preliminary stage, we allowed him to go and come back when we had enough issues to question him about. “He left and never came back. We later got to know that he has left the country for America. We were also looking for Mary Iya Badeh, the wife of the first defendant, who is one of the directors in the second defendant (Iyalikam Nigeria Limited). “The second defendant (Iyalikam) had received so much funds from the alleged funds we are investigating. “She too, according to the investigation has left the country for America. Kam Badeh (another of Badeh’s son) is one of the directors in one of the companies. “We have gone round the locations that we had information that he does business, but we are unable to get him. He said when his team concluded investigation in the case, it “discovered that the first defendant (Badeh) and his wife had earlier incorporated a company Iyalikam Nigeria Limited” in whose accounts they allegedly diverted the Nigerian Air Force’s funds. Justice Valentine Ashi, of the Federal Capital Territory High Court, has ordered the Economic and Financial Crimes Commission (EFCC), the Department of State Services (DSS) and other security agencies to arrest Diezani Alison-Madueke, former minister of petroleum resources,within 72 hours. According to Tony Orilade, the order was made following an ex parte motion made before the court by Msuur Denga, counsel to the EFCC. Denga prayed for an order of the court to issue a warrant of arrest against Madueke, to enable the commission apprehend and arraign her for alleged financial crimes in Nigeria. The former minister has been living in self imposed exile in the United Kingdom since her exit from office in 2015. The UK authorities have also been investigating her for suspected financial crimes. The Federal Government on Sunday said the search on the aircraft of the presidential candidate of the Peoples Democratic Party, Atiku Abubakar, at the Abuja airport was a routine exercise that applied to all international arrivals. The Minister of State, Aviation, Hadi Sirika, who said this in a statement made available to journalists in Abuja, that while it was true that the Task Force on Currency at the airport did the routine action of checking the former Vice President’s travel bag, he was accorded full respect as a senior citizen. He described the checks as mandatory, conventional, internationally applied and routine, adding that no one is excused from them under the nation’s laws. While urging law-abiding citizens to respect the laws of the country, Sirika advised prominent Nigerians not to seek to be treated over and above the citizens they wish to serve. The minister claimed that the public outcry that followed the routine exercise was a mischievous attempt to grab headlines. “This is a mischievous attempt to grab the headlines. Nigerians need to know that one of the resolutions of the Atiku team at their recently-concluded, opulently-held Dubai retreat was to embark on scaremongering. This is one of such. “For the records, all incoming passengers on international flights go through customs, immigration, health and security screening. “Where the aircraft is using the private, charter wing, as the PDP candidate did, such arrivals are met by a team of the immigration, customs and other security agencies. They go to the arriving aircraft as a team. “The airport authorities confirm that this is a routine process, applying to all international arrivals, including the minister unless the passenger is the President of Nigeria. The President, the Vice President and passengers aboard planes on the Presidential air fleet use the Presidential wing of the airport. “It is also important to state that even in the Presidential Wing of the airport the President of Nigeria uses, there is the presence of immigration and other security officials who must stamp his or her passport on arrival. Atiku had earlier confirmed that he was searched upon arrival in the country from Dubai. Oshiomhole was reportedly detained for nine hours by the DSS on Sunday before leaving for the US. The Cable reported that Oshiomhole arrived London from the US on Thursday where he met with Bola Tinubu, chieftain of the APC. 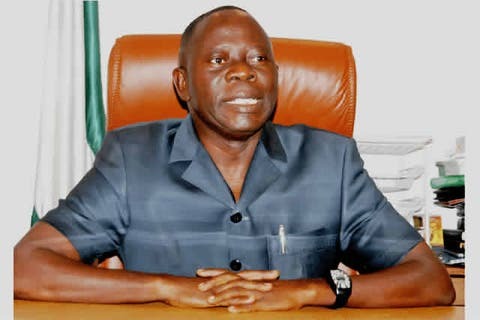 The National Chairman of the All Progressives Congress, Mr Adams Oshiomhole, is expected to return to the Department of State Services for further interrogation anytime he returns to the country, The PUNCH learnt on Thursday. It was also gathered that President Muhammadu Buhari was aware of the investigation of the former governor of Edo State by the security agency. It was gathered that the President was informed by the Director-General of the DSS, Mr Yusufi Bichi, about the desire of the agency to grill Oshiomhole over allegations levelled against him by some aggrieved members of the party. Presidency sources told one of our correspondents that the President actually asked the secret police to “go ahead and do their job” when he was told about the allegations of the party chairman. It was reported on Wednesday that the DSS grilled Oshiomhole for about nine hours between Sunday and Monday before he travelled out of the county. Security sources confirmed to one of our correspondents that Oshiomhole would be expected to return for interrogation on his return to the country. Investigations showed that the interrogation of Oshiomhole was kept secret because the DSS believed it was a party matter. Apart from this, our correspondent gathered authoritatively that the DSS was planning to send the report of its investigations to the President alone. The source said, “The comrade (Oshiomhole) is expected to return for further interrogation when he returns to the country. That’s why we released him on administrative bail. “We are still looking at his statements and also carrying out further investigations. This type of operation is not meant for the members of the public. Meanwhile, the Director-General of the Voice of Nigeria, Osita Okechukwu, has urged the DSS to probe Oshiomhole ’s call logs for the period the party’s primaries lasted. Oshiomhole, who became the national chairman of the party less than five months ago, has been having a running battle with some governors and leaders within the ruling party. The leaders and the governors believed that the former governor did not handle the just concluded party primaries across the country well. It was learnt that some of the governors, especially those who were unable to secure party tickets for their favourite candidates, had been mounting pressure on the President to overrule the party chairman on the choice of candidates from their states. He also called on the Economic and Financial Crimes Commission to join the DSS in looking into the financial transactions made by the party chairman within the period under review. Okechukwu, who is a chieftain of the party in Enugu State, made the call at a media briefing at the party’s national secretariat in Abuja on Thursday. He argued that recent revelations about the national chairman’s grilling by the DSS over allegations of financial impropriety were sufficient reasons for him to resign. The VON DG said, “Penultimate week, I joined the league of APC moral leaders, faithful and men of good conscience to call on Comrade Adams Oshiohmole, to honourably resign forthwith as the chairmanship of our great party. In his usual narcissistic disposition, he refused. “As the Oshiohmole Must Go wave raged, the Department of State Services got wind of it. They interrogated him and I patiently waited to read from Comrade Oshiomhole and his spin doctors over his tango with the DSS; in the social or main stream media, neither rebuttal nor denial came from them. The party chieftain said the APC and the President would be the better for it if the Chairman stood down to allow the party to go into the 2019 election season with its credibility intact. He further said, “One would not bother you with Oshiomhole’s malfeasance as his nepotism, undue substitution of candidates and cash-and-carry primaries are on the public domain. Senator Ibikunle Amosun, governor of Ogun state, says he is not behind the interrogation of Adams Oshiomhole, national chairman of the All Progressives Congress (APC), by the Department of State Services (DSS). Oshiomhole was reportedly detained and quizzed by the DSS after some APC governors alleged that he received bribes during the party’s primary elections. The APC chairman was pressured to resign during the interrogation. He reportedly travelled out of the country after his encounter with the secret police. Amosun fell out with the leadership of the party after it chose Dapo Abiodun as his state’s gubernatorial candidate. The governor’s preferred candidate is Abiodun Akinlade. Speaking with journalists at the presidential villa after meeting with President Muhammadu Buhari on Thursday, Amosun said he does not “have to hide under a finger to fight” anyone. “I think you are probably giving me an oversight role and I am not a security person, so clearly I think that question will not be for me. I don’t have to hide under a finger to fight,” the governor said. When asked to comment on Oshiomohole’s reported trip out of the country, the governor said he is “not well suited” to respond to such a question. “I have told you those things are beyond my pedigree and you are asking me questions that I am not well suited for,” Amosun said. Ibrahim El-Zakzaky, leader of the Islamic Movement in Nigeria (IMN), and his wife will remain in custody as a high court in Kaduna state has refused to grant them bail. Gideon Kurada, presiding judge, denied the bail application on the ground that El-Zakzaky did not attach a medical report to it. El-Zakzaky is facing trial over allegations of culpable homicide, unlawful assembly, and disruption of public peace, among other charges. The case was subsequently adjourned to January 22, 2019. The Shi’ites leader has been in the custody of the Department of State Security (DSS) since December 2015. There was heavy security presence around the court premises during the hearing. Yakubu Sabo, Kaduna police public relations officer, had earlier said a ban on all forms of processions in the state was still in force. Last week, El-Zakzaky’s followers marched into the streets of Abuja to protest the continued detention of their leader. The protest resulted in a face-off with security operatives, with many Shi’ites killed and several injured. In 2016, El-Zakzaky was granted bail by a federal high court in Abuja. Gabriel Kolawole, the presiding judge, had ordered his immediate and unconditional release, however, he remained in the custody of the DSS. Adams Oshiomhole, national chairman of the All Progressives Congress (APC), was detained by the Department of State Services (DSS) on Sunday, according to a report by The Cable citing sources. Oshiomhole was grilled by DSS operatives for nine hours after some APC governors alleged that he received bribes during the party’s primary elections across the country. Sources told the paper that the APC chairman was asked to resign during interrogation by the DSS. But Oshiomhole resisted the pressure to resign, saying he would only do so if he loses the confidence of President Muhammadu Buhari. The APC chairman told the DSS that the president was in the loop of every action he took during the party’s primaries. “Adams Oshiomhole was arrested by the DSS, they didn’t show him any petition. It was alleged by some governors that he collected bribe during the primaries,” a source said. Another source said the president expressed shock at the governors’ move, saying he was not aware of the development. The APC primaries were marred by controversies. Elections in some states had to be repeated. In Zamfara, the Independent National Electoral Commission (INEC) said the party will not participate in the 2019 polls because it could not successfully conclude its primary before the deadline. In Imo, the APC favoured the governorship candidacy of Hope Uzodimma, senator representing Imo west, over Uche Nwosu, son-in-law of Rochas Okorocha, governor the state. Ibikunle Amosun, Ogun governor, fell out with the party’s national working committee (NWC) after it chose Dapo Abiodun as the state’s gubernatorial candidate. Abiodun Akinlade is Amosun’s preferred candidate. A number of APC governors have expressed disappointment over the way the national leadership of the party had gone about the issues, hence the move against Oshiomhole. Mojirayo Ogunlana-Nkanga, a lawyer, has asked the Department of State Services (DSS) to release Ahmad Sakwaya and Garba Alhassan who have been in the agency’s detention for 460 days without trial. In a letter dated October 24, addressed to the director-general, Ogunlana-Nkanga said her clients, who are car sales agents, were arrested on July 15, 2017, by DSS operatives over a “business transaction with a terrorist”. She said Ahmad and Garba had a transaction with one Malla Lawan, a car dealer, who had been arrested by the agency on the suspicion of being a terrorist. Ogunlana-Nkanga demanded that the detainees be released within seven days or she would institute legal action against the DSS. “Mr Ahmad’s wife, Hajiya Hassana Ahmed Mohammed, informed us that on the said 15th of July 2017, your office arrested only Mr. Ahmad and Mr. Garba over the funds they both received from Malla during the course of their legitimate business as known car sales agents. Consequently, your officers seized two Toyota Sienna cars belonging to Mr. Garba,” she wrote. “Our clients also informed us that your office has detained Mr. Ahmad and Mr. Garba at the SSS headquarters in Abuja for over one year and three months without trial. To this day, both Mr. Ahmad and Mr. Garba have not been seen, nor heard from, nor had any access to family, counsel, and medical attention. “The act of subjecting Mr. Ahmad and Mr. Garba to continuous detention, concealing of their fate and whereabouts from their wives and children, depriving them of liberty and placing them outside the protection of law for over four hundred and fifty days (460) is a breach of their rights not to be subjected to enforced disappearance as guaranteed by Article 1 of the International Convention for the Protection of All Persons from Enforced Disappearance and amounts to gross impunity and violation of their rights above mentioned. Yusuf Bichi, the new director-general of Department of State Services(DSS), took control of the secret service on Friday. Peter Afunanya, spokesman of the agency, said Bichi addressed the management of the organisation at the DSS headquarters in Abuja. He solicited support of members of the agency. “While calling for stronger ties among the staff, he pledged to work with them as a team,” Afunanya said in a statement. Bichi also affirmed that the service would support government agenda on rebuilding the economy, stamping out insecurity and fighting corruption. He implored the management to ensure that the service respects rule of law and human rights. President Muhammadu Buhari appointed Bichi on Thursday. The agency had been under the headship of Matthew Seiyefa since 7 August when Lawal Daura, former director-general of the agency, was sacked by Acting President Yemi Osinbajo for sending DSS operatives to mount a blockade of the national assembly. “He is an astute and versatile administrator; a highly detribalised Nigerian and an intelligence officer of immense repute,” Afunanya said. Former finance minister, Kemi Adeosun says her NYSC exemption certificate was screened and cleared by the Department of State Services (DSS) before she was appointed minister by President Muhammadu Buhari in 2015. In her resignation letter dated September 14, 2018, she said she had no reason to believe her certificate was not genuine until it was reported by an “online medium” — a veiled reference to Premium Times which reported the infraction. Her missive calls to question the credibility of the DSS investigative capabilities, which recent revelations indicate has generally relied on intimidation, brute force, blackmail, extortion and none of the painstaking efforts in establishing the facts by simil6organisations such as the FBI of the United States. President Muhammadu Buhari has appointed Yusuf Bichi as the new director-general of the Department of State Service (DSS). Garba Shehu, presidential spokesman, disclosed this in a statement issued on Thursday. The statement described Bichi as a “core secret service operative”. “The new DSS boss comes to the job with skills in intelligence gathering, research analysis, conflict management, general investigation, risk and vulnerability operations, counter intelligence and protective operation and human resources management,” the statement read. The new director-general began his career in the security division of the cabinet office in Kano, from where he joined the Nigerian Security Organization (NSO), the precursor of the present DSS. “Bichi has undergone training in intelligence processing analysis, agent handling recruitment and intelligence processing in the UK, as well as strategic training at the National Defence College,” the statement read. He is married and with children. While Buhari was on vacation in London in August, Vice-President Yemi Osinbajo fired Lawal Daura, former director-general of the agency, and appointed Matthew Seyeifa in acting capacity. This followed the invasion of the national assembly by armed DSS operatives. The plea came via a press statement issued on Tuesday and signed by its its spokesperson, Afunanya, Peter N.
In an obvious reaction to speculations in a section of the media that its acting Director General, Mathew Seiyefa, may be removed and the dismissed boss, Lawal Daura recalled because the former reportedly carried out a re-organization without the clearance and approval of The Presidency, the DSS said speculations on its internal affairs are not healthy. “1.The attention of the DSS has been drawn to several speculations making the rounds in the media on some internal affairs of the Service. These speculations, to say the least, are unhealthy for the Service and indeed, Nigeria. The DSS has undoubtedly remained a committed Service with focus on the stability and security of the nation. Over the years, the Service has been known to be both a strategic stabilizer and a unifying factor in the Nigerian project. It therefore deserves and desires to be focused and supported by all stakeholders to play the expected role in a democracy. Only a professionally driven DSS can support and consolidate Nigeria’s democracy. Though Intelligence Services world over operate covertly, it is also held accountable in a democratic practice. To accomplish this, they design strategic alliances with partners and stakeholders. The media is one of such partners. Held in utmost respect, the media is called upon to report issues of national security with caution to avoid a breach of peace. No deliberate effort should be made by self serving interests to bring the Service to ridicule. No country or its media can afford to undermine their own security forces because of the dire consequences that portends. The Service, as an institution of Government will continue to carry out legitimate orders; support democratic institutions; respect the rule of law and protect the citizens in line with global practices and Standard Operations Procedures (SOPs) in Intelligence gathering and law enforcement. Dark forces should not bring the Service into a collision with the Government it is meant to diligently serve. There are indications that recently sacked Director General of the Department of State Services (DSS), Lawal Daura may be recalled to his duty post following new developments within the presidency. A top security source close to the presidency and conversant with the new development told PRNigeria that plans are afoot to reverse the various reorganisations embarked upon by the new Acting DSS boss, Mathew Seiyefa. “The presidency is not happy with some recent deployment by the acting Director General of DSS, Mathew Seiyefa especially the redeployment of Director of DSS in Kano, Alhassan Muhammad to the Headquarters in Abuja and the deployment of Director Operations at the Headquarters, Mr. Godwin Bassey Eteng who was moved to the Institute of Security Studies, Abuja as Director. And the posting of another officer from Kebbi to serve as the Chief of Staff to the DG in Abuja. The recall of Lawal Daura may portend misgiving in the eyes of both local and international communities in view of the current development is what security pundits could not clearly discern. Barely a week ago, PRNigeria carried a report to the effect that the sacked DSS boss rose up to defend himself of allegations of highhandedness and carrying out actions without the approval and knowledge of the Commander-in-Chief, notably the siege on the National Assembly. The associates of former DG DSS claimed that Daura was neither given query over any issue nor indicted on his handling of affairs of the service until his sack. Daura insisted that he took all actions in national interest through a collective responsibility, including involvement of principal officers of sister agencies even though he did not disclose who authorised the siege on the National Assembly (NASS). Daura was reported to have felt demoralised after being tagged as a mole of the opposition elements for laying a siege on the National Assembly. He insisted he took the daring moves to protect the Presidency and the ruling party against the antics of the powerful opposition elements. It was reported that when he was invited by the then Acting President Yemi Osinbajo for the security briefing, he quickly rushed out and left some of his personal belonging including phones in the office. He noted that when he was whisked away and eventually sacked, he did not know his offence. Former Department of State Services (DSS) Director-General Lawal Daura, who has been in custody since August 7 when he was sacked, has been allowed access to his two wives and some associates, according to sources. Daura got the boot after DSS operatives blocked the National Assembly, on his directive. But the former security chief, according to one of his associates who visited him, insists that he acted in the national interest. He also said the decision to deploy operatives in the National Assembly on July 24 was in conjunction with other security agencies. Daura is being held in a safe house in Abuja, awaiting the Presidency’s decision on the report of the Inspector-General of Police Ibrahim Idris who investigated his action. It was learnt that President Muhammadu Buhari referred the IGP’s report to Vice President Yemi Osinbajo for his input. Some associates of the ex-DSS chief are pushing for Daura’s reinstatement or the removal of National Security Adviser Babagana Monguno and Economic and Financial Crimes Commission (EFCC) Acting Chairman Ibrahim Magu. A source, who spoke in confidence, said: “The former DG is still in a safe house but now with access to his wives, children and associates. He does not know what the presidency has for him. He is awaiting President Buhari’s decision. “His ultimate desire is to let the President and Nigerians hear his own side of what really transpired on August 7. He is desirous of freedom now. He wants to return to his house. “There is, however, an uneasy calm in government circle on how the President will resolve the matter. I think he is awaiting a brief from the VP on IGP’s report”, a government source added: “All officials, including ministers, are avoiding talking on Daura to avoid being accused of taking sides. A close associate of Daura has told PRNigeria (a news agency) that the ex-DG was neither given a query over any issue nor indicted in his handling of affairs of the service until his sack. The close associate, who pleaded not to be named, said Daura insisted that he “took all actions in national interest through a collective responsibility, including involvement of principal officers of sister agencies even though he promised not to disclose on whose authority he acted to lay the siege to the National Assembly. According to the source, Daura felt demoralised after being tagged a mole of the opposition elements. Jones Abiri, a Bayelsa-based journalist, has asked the Abuja federal high court to compel the federal government to pay him N200 million as compensation for spending two years in detention. In July 2016, Abiri, publisher of Weekly Source Newspaper, was arrested by Department of State Services (DSS) and accused of being the the leader of the joint revolutionary council of the Joint Niger Delta Liberation Force, a separatist group. The journalist was also accused of threatening oil companies and demanding money from them. He was arraigned for the first time after two years in July following public outcry. Abiri was granted bail in August. In the application already filed at the court by his lawyers led by Femi Falana, Abiri said the DSS violated his rights and tortured him. The journalist argued that his prolonged detention without a trial violates his dignity of person and freedom of association. The application could not be heard when it was called on Monday as G. O. Agbadua, counsel to DSS, had not filed an affidavit, replying to the motion brought against his organisation. Agbadua told the court that he would need more time to respond to the motion. The matter was then adjourned till September 3. Rafiu Adebayo and Isah Misau, senators representing Kwara south and Bauchi central, have sued Abubakar Malami, attorney-general of the federation, the Department of State Services (DSS) and the senate over an alleged plot to remove Bukola Saraki as senate president. Joined in the suit marked FHC/ABJ/CS/872/2018 are the senate president, deputy senate president, senate leader, deputy senate leader, minority leader, deputy minority leader, clerk of the senate, and deputy clerk of the senate. The suit was filed at the federal high court, Abuja, on Monday. In the originating summons filed by Mahmud Magaji, their counsel, the lawmakers are asking the court for an order of interlocutory injunction restraining the AGF and the inspector-general of police (IGP) from unlawfully interfering with the legislative duties of the senate president pending the hearing and determination of the summons. They also asked the court to determine whether Saraki can be compelled to vacate his office on the grounds that he is not a member of the political party with a majority of senators in the senate in view of section 50 of the constitution and order 3 rule 8 of the senate standing orders. The lawmakers prayed the court for an order of interlocutory injunction restraining all the defendants, jointly and severally either by themselves, their agents, servants and privies from unlawfully removing the senate president pending the hearing and determination of the substantive suit. They also asked the court for an order of interlocutory injunction stopping the IGP and the DSS from harassing, intimidating, arresting or detaining the senate president in respect of the lawful exercise of his duties pursuant to section 50(1) of the constitution and another order directing parties in the case to maintain status quo pending the determination of the substantive matter.